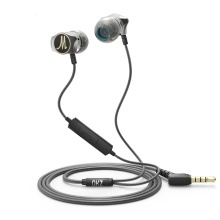 QKZ DM7 wired earphones with metal appearance is fashionable. It is suitable for almost all audio devices with 3.5mm port. In-ear design with soft earcaps, comfortable to wear and not easy to fall. Also, in-line microphone and control button provide easy operation. 10mm high-fidelity dynamic driver unit provides natural clear sound and super enhanced bass. In-ear headphones with 3 sizes of soft earcaps ensures a long time comfortable wearing and noise isolation. Adopts 4 strands of 56 core LFC transparent wire, anti-twist, anti-pulling, durable and flexible to use.